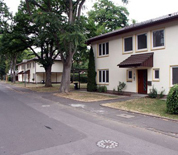 US Army Garrison Schweinfurt is located in Schweinfurt, Germany. The garrison is located on two installations, Ledward Barracks and Conn Barracks, and two housing areas. The installation also includes a local training area that offers a variety of training grounds and facilities for both tenant and transient units. The base is scheduled to be closed and returned to the German government in Fall 2014. This USAG Schweinfurt directory features the critical info you’ll need to navigate through the facilities that remain on base.